My cats love to enlarge their boundaries all the time. They lay on the floor, observe for a long while. And take action! Yesterday night, I came home in blue. Sitting in front of the web, striking key following key. My lovely kitten was sleeping on my sofa bed. Happy birthday, my sweetie Sam Tung & Ovaltine! 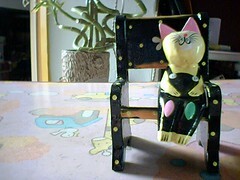 The lovely cat sitting on the chair is a gift from a friend… he’s in bad bad mood too… hope he’ll get well soon. Typhoon signal No. 1 is hosted for hours. The relative low air pressure near the typhoon brings away the clouds. The sun is so strong today, and my skin can feel its burning energy. It seems that the typhoon will leave us very soon, and its good, coz the studios schedule is packed enough. We cant afford any delays. Its been sunny for weeks. The plants outside my office dont like the sun. They become soft and bend their waist… the janitor sees them, and choose to water them. 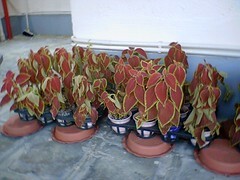 I stop her immediately, coz watering under strong sun will kill the plant – just like pouring water over hot metal! Better do those watering jobs just before sunrise. However, no one will do so. Frontline is so busy recording the 2nd album. Of course, there’re still many follow-up jobs like design, printing, writing text… but I just can help in music production. Having recording session nearly every night, I haven’t seen my friends for a decade! Yeah, I miss the life being an ordinary people. I enjoy music so much, and join this singing group for over 9 years. We love to sing “a capella” and harmony. In the journey of being a singer, I start to learn music related stuff, e.g. music instruments, music theory, audio theory and operation. I dream that in one day, I can make my living solely in music industry. So I start writing lyrics! Not exactly! The song is written by the producer, Steven Ip. The first time I hear his playing with the piano, I’m shocked, and moved by the chords he uses. The song is emotional and sophisticated, and I can smell the color of the mood. I use three days to finish the 1st edition, and I love that edition. It’s about growing in love through different stages. And actually it’s reflection of my real stories… I’m so touched by both the music and the lyrics I write. As the final arrangement comes to the studio, we find that it’s a bit different from the way we interpret the song. So I need to REWRITE! One sunny day, I go to the Stanley for a vacation… to slow down my pace, and get some idea from the nature for the new edition. 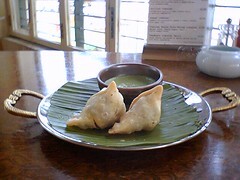 It’s a nice experience for me to have such a half day out. And I really enjoy the tea set @ Bayside Brasserie. Tonight, the producer turns me down the second time: since I’m so new to lyrics-writing, I need much more time than other lyrists to do touch-up, while the project progress doesn’t provide me such condition. I quit, eventually. Anyway, thanks for zale and wayland for lending me your ears and fingers! I’m longing for another vacation, maybe with some friends, to enjoy that wonderful tea set at the Stanley in someday.